Family lore dates the Santa Barbara arrival of stonemason and musician Antonio Da Ros to 1920, give or take. The youngest of 12, he left his native Italy on or around 1912 to join his uncle in New York, building brownstones along the Hudson River by day and playing saxophone by night. Working his way across the country with his trade and talent, including a stint in the copper mines of Jerome, Arizona, Da Ros came to Santa Barbara because he’d heard the Marisol Hotel — located where Alice Keck Peck Memorial Garden is today — was looking to put together a house band. Antonio got the gig. At the same time, he launched what is now Da Ros Masonry. Naturally, his line of work required the accumulation of masonry materials, and according to his grandson, Peter Da Ros, who now runs Da Ros Masonry, Antonio “had a yard here [on the Lower Eastside] with piles of rock and brick and stuff like that.” He sold surplus material on an honor system, wherein customers would weigh what they needed and drop payment in a bucket next to the scale. That original yard — given to Antonio in exchange for forgiving an unpaid masonry bill — is where the business stands today, at the corner of Nopal and Mason streets. “Our roots are really in the stone industry,” says Peter. When Antonio passed away in 1941 — from lung disease after being sprayed with mustard gas during the Battle of Verdun, in World War I — his son, Ozzie, took over the business, spent three years in World War II, and in 1958 launched Da Ros Stone; a decade later he changed the name to Santa Barbara Stone. Ozzie’s daughter (Peter’s older sister) runs the operation. “I’ve always been a numbers person,” she says. The stonework of three generations of the Da Ros family and their crews can be spotted pretty much everywhere you look in Santa Barbara, from Clark Estate and Lotusland to the Santa Barbara Museum of Natural History and UCSB’s Robertson Gymnasium. 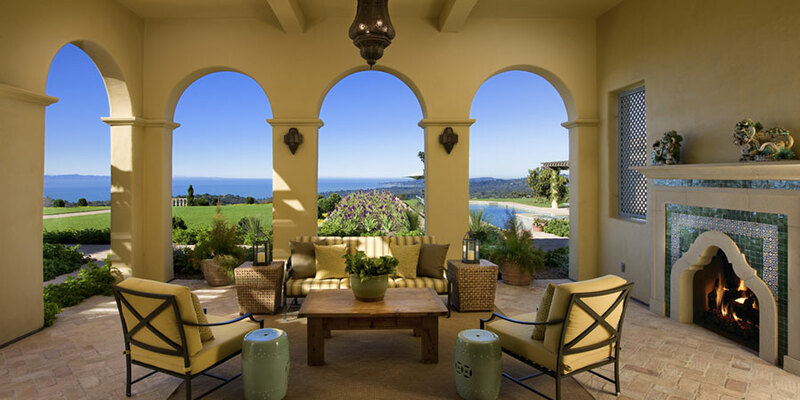 Da Ros has also worked very closely with Giffin & Crane on a number of Montecito estates, including one of our earliest high-end custom homes, in the Ennisbrook community, nearly 30 years ago. Giffin & Crane excel at exemplary homes built to last; Da Ros’s stonework is often the perfect fit.